Gifting away a business card has been one of the most important processes of socializing and marketers have been performing it all these years to achieve success. Making your contact information more accessible and reliable through customized 2x3.5 business card magnets full color is a best thing to do. With all your business information imprinted, it is extremely easier to distribute it during any tradeshows or special promotional occasions or business events. Most people are likely to retain attractive business card magnets over visible spaces within their homes or offices. 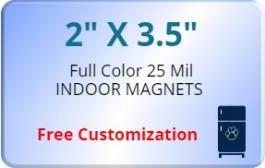 Request a quote to know price savings on bulk orders of personalized 2x3.5 full color business card magnets. Product Weight: 8 lbs per 500 magnets.